August got away from me. I had plans for more...not fewer...posts this month. But it was not to be. Now that I think about it, the whole summer has flown by. Perhaps yours has too. And here we are, approaching Labor Day weekend...the official last blast of summer fun. Cooking an elaborate meal is probably not what you had in mind for this last relaxing weekend of summer. Maybe you have plans for a quiet weekend with your family—or maybe a not so quiet weekend with friends—at a cabin....or a lake house. 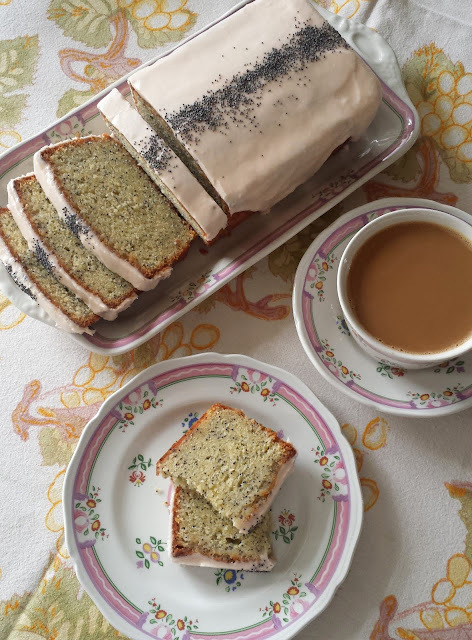 Or maybe you're plans are to just hang out at home....maybe finishing up your summer project.... Whatever your plans, my recipe today is just the thing for your relaxed weekend. It requires little cooking...can be expanded or contracted to accommodate any size group....and will make salad lovers and meat lovers alike happy. It is a summer variation on the classic Cobb Salad. I first made this salad a few summers ago when I was visiting my best friend. We love to cook together... but we also love to talk. Sometimes our days get away from us and before we know it, it's time for dinner. I whipped this up on just such an evening. We enjoyed it by her pool as the sun slipped down over the horizon. The salad was so pretty and colorful, bathed in the late evening light reflected off the pool, that I took a quick picture. I was reminded of that easy and delicious meal when that picture showed up in my Facebook memories earlier this month. It looked so good to me that I wanted to make it again. 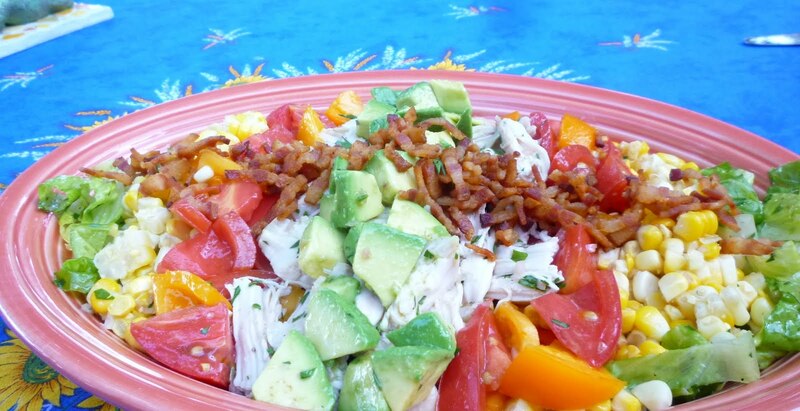 Classically, a Cobb Salad is a composed salad (all of the ingredients are arranged individually on the platter...rather than tossing them all together as for the appropriately named "tossed" salad) that includes cubed/shredded roast chicken (or turkey), crisp bacon, chunks of avocado and tomato, wedges of hard cooked egg and blue cheese. 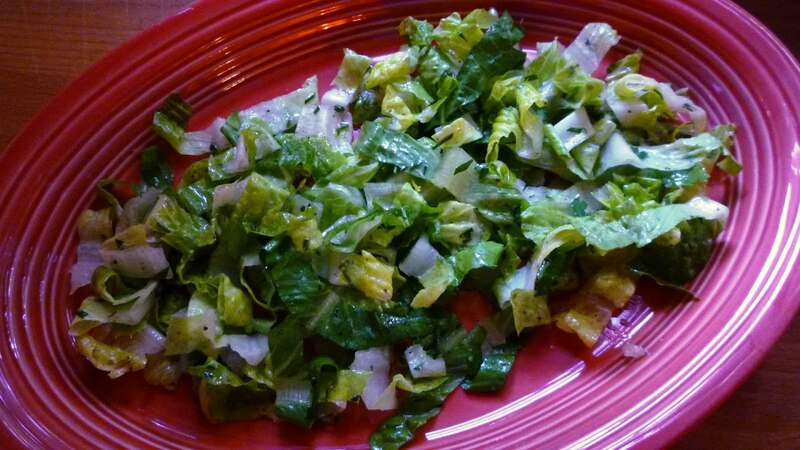 These items are arranged in neat rows on a bed of crunchy greens (most often romaine or iceberg). The greens and several of the individual components are dressed in a tangy vinaigrette. It is almost an anti-salad it is so rich and substantial. 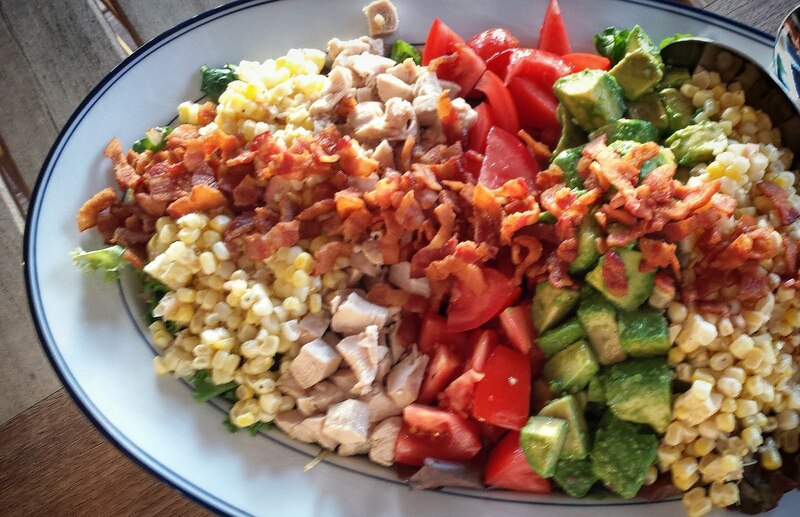 I don't think I know anyone who doesn’t like a good Cobb Salad. 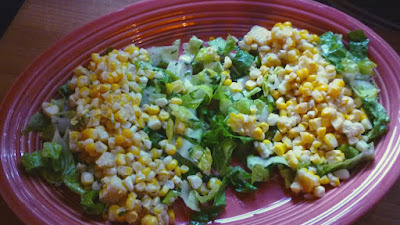 My friend is not fond of eggs or blue cheese, so these items didn't make the cut for our summer variation on the Cobb. But we both love roasted corn. 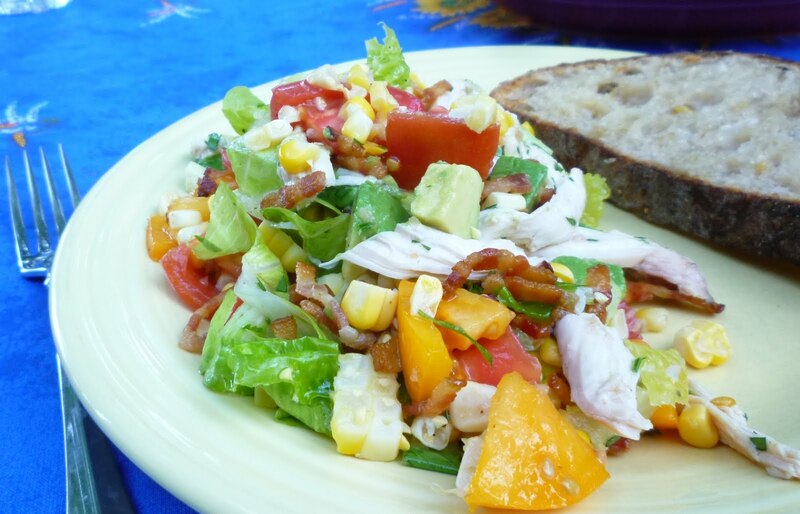 And roasted corn just happens to be delicious with bacon, tomatoes, and avocados. I think I may even like this version better than the original. I have not yet added blue cheese...but I'm pretty certain it would be a fine addition. I am giving instructions for cooking the chicken the way I like it when I'm having it in a salad...but you may cook it however you please. Roast it, grill it, sauté it, poach it... Use white meat or dark... You can even use a purchased rotisserie chicken if you like. The only other cooking required is frying up the bacon...and roasting the corn. If you prefer to not turn on your oven, the corn can be thrown on the grill...or shucked and boiled on the cob. Everything else is a matter of slicing and dicing...a little mixing...and then arranging it all. To complete the meal, add a loaf of crusty bread....a nice bottle of Rosé...and a simple dessert (ice cream...cookies or brownies...maybe pound cake with fresh fruit....). Then, sit down... relax.... and soak up the last rays of the summertime sun as it slips out of sight. 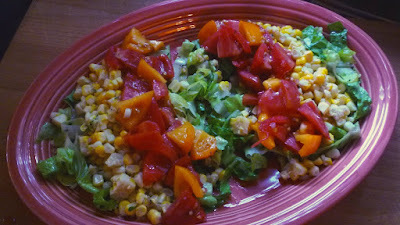 I am giving the ingredients and the quantities for the salad I made recently for two. These quantities were perfect for us...but they might not be perfect for you. Multiply and alter the quantities and relative ratios of each of the ingredients as you prefer and choose a platter that is shallow and wide. Start out with a base—spread over the whole patter—of well dressed greens. As is evident from the pictures, I like to create a symmetrical platter of items...but classically, each ingredient only appears in one strip. If you have equal quantities of each ingredient, this approach works well...but if you have a lot more of one or two ingredients, laying them out in two places at opposite sides of the platter is very attractive. 1 split chicken breast—about 10 to 12 oz. Rub the chicken with a light coating of olive oil and season generously with salt and pepper. Place the chicken in a baking dish and roast in a 450° to 475° oven until the skin is crisp and golden and an instant read thermometer inserted in the thickest portion reads 150° to 155°--about 25 to 30 minutes. (The chicken will easily reach the safe temperature of 160° as it rests.) As the chicken roasts, regulate the oven temperature to maintain an active sizzle. Remove the chicken from the oven and let sit until cool enough to handle. If desired, deglaze the baking pan with water. Degrease and reserve the resulting jus. When the chicken has cooled, remove the skin and bones and discard. Dice or shred the meat into bite-sized chunks. Toss with jus if you deglazed the pan. Set aside or chill if not using right away. While the chicken cools, make the vinaigrette and gather/prepare the remaining ingredients. To make the vinaigrette, place the shallot, vinegars, and a couple of good pinches of salt and some pepper in a bowl and let sit 5 minutes. Whisk in the olive oil. Taste for balance and seasoning. Correct as necessary. Rewhisk before using. Season and dress the greens with the vinaigrette and a scattering of parsley. Spread the greens over the platter. 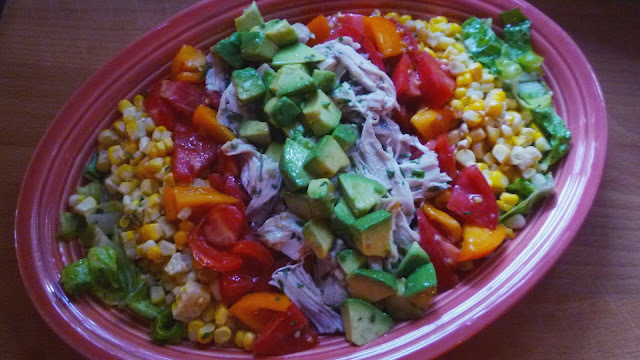 Similarly season and dress separately the chicken, corn, tomatoes and avocado. As you dress them, arrange them in strips on top of the greens. Place the bacon in a strip that runs perpendicular to all of the other strips. Serve, passing more dressing on the side. Note: To roast corn, place the corn (in the husk) in a preheated 375­° oven. Roast for 20 minutes. Remove from the oven and remove the husks as soon as you are able to handle the corn. Cool and cut the kernels away from the cob. A large ear of corn will produce 1 to 1 1/2 cups of kernels. Lovely, Paige! Thank you very much for the supper inspiration! As always, I appreciate all you put into a great post like this one! Thank you Bonnie! I hope you and Eric enjoy it. As it happens, this is what Nancy and I had for our work lunch today!